Combitronic™ is a proprietary communications protocol developed by Moog Animatics exclusively for the SmartMotor™. With Combitronic™ technology, any SmartMotor™ can read from, write to, and control any other SmartMotor™, can act as the master, and can pass master control from one SmartMotor™ to another – virtually eliminating the need for a PLC or other bus master. 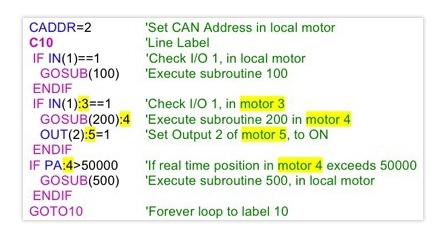 With conventional systems, this would take a massive amount of time writing communication code and learning a new fieldbus protocol, but with Combitronic™ communication, all you do is address each SmartMotor™ with a colon followed by its CAN address (see the sample code). 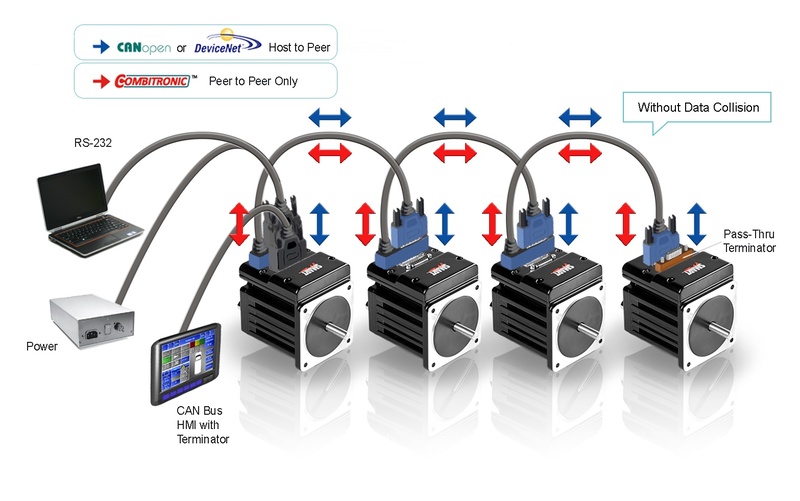 Combined with the CDS7 motor option, the latest offering from Moog Animatics that allows a simple, single-cable, power and communications connection from motor to motor,1 the machine builder has a simple, cost-effective way to build a network of Class 5 D-Style SmartMotor™ integrated servos. No other integrated motor manufacturer offers this capability. The CDS7 option combined with Combitronic™ technology provides the 1-2 punch that machine builders need to get ahead of their competition, allowing faster development, easy machine replication, and quick to market. 1Proper termination is required at each end of the bus. For details, see the Class 5 SmartMotor™ installation and CANopen guides. 2Requires the CDS7 SmartMotor™ option and CDS7 Add-A-Motor cables or equivalent customer-supplied cables.